NewsHome » News » A Seventh Place Finish Misrepresents the Efforts of Jesse Lazare, Chris Green and the MIA Team in California! A Seventh Place Finish Misrepresents the Efforts of Jesse Lazare, Chris Green and the MIA Team in California! September 24, 2017.- This weekend, Quebec’s Motorsports In Action (MIA) team and its Montreal drivers Jesse Lazare and Chris Green contested the penultimate round of North America’s Endurance series, the IMSA Continental Tire SportsCar Challenge, at the Laguna Seca circuit in California. 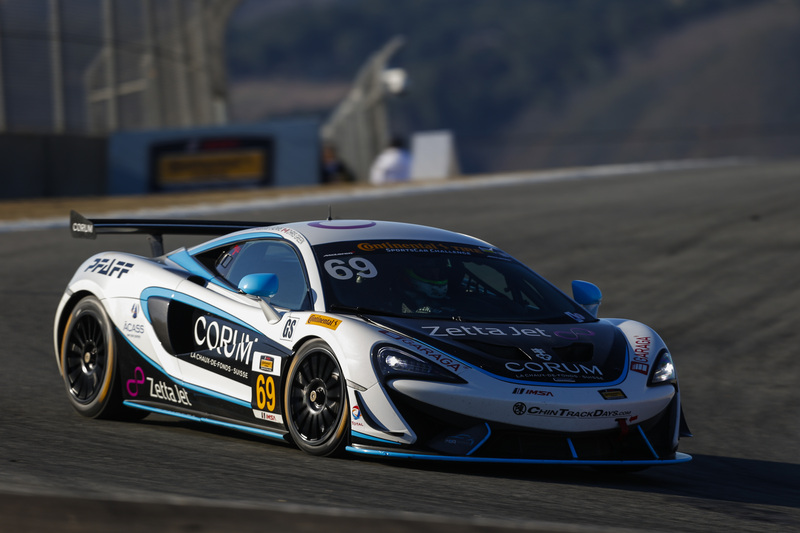 A four-hour race, twice as long as the other races held this summer, saw the McLaren 570S GT4 #69 in the lead longer than any other competitor or team, before Chris Green was sent spinning with only two laps left, while he was in second place. The weekend had a rough start for the MIA team, as was the case for the other competing McLaren GT4, which were significantly off the pace at the tricky Laguna Seca track. « We worked very hard and opted for “aggressive” changes during the free practice, which turned out to be beneficial. With help from Ian Willis, the respected owner of the AIM team, they finished by getting the right qualifying and race setups, enabling Jesse Lazare to make his way to the front starting line », confided team owner Eric Kerub. The Pfaff McLaren/Garaga endorsed #69, driven by Jesse Lazare, found itself in second position during the first few minutes of the race, but by the time one hour was completed, Lazare and Green were leading the event. Their position barely changed and by mid-point of the race and the start of the last hour, the MIA team’s McLaren was still at the top of the leaderboard. After executing a perfect race strategy and flawless pit stops, the MIA team, with Chris Green at the wheel, found themselves in a podium position with only minutes remaining. As he was completing the second to last lap, Green fell victim of a rear end hit from an over ambitious competitor that misjudged his braking, causing a spin, and eliminated any potential podium that the team worked so hard for in 3 hours and 57 minutes of this 4 hour enduro. The Lazare/Green duo eventually finished the event in eighth spot, which turned into seventh place in the official race results when the competitor that sent Chris Green in a spin was penalized by the officials at the finish. The MIA team and its drivers completed excellent work throughout the entire weekend in California. Despite the disappointing result, all team members want to finish the season on a position note, as explained by team owner Eric Kerub : « we were one second slower than the others manufacturers during the free practice but go everything right when it counted and lead for more than half of the race», he confided prior to continuing : « Chris had a broken rear diffuser early in his stint which certainly caused some performance loss with an hour to go. This, with combination of the extremely strong Aston Martin’s over the weekend made a victory impossible, but losing second place that way really hurts. The entire team did a perfect job this weekend and that’s the major positive point to retain ». The next round of the 2017 championship of the IMSA Continental Tire SportsCar Challenge series will take place in two weeks at the Road Atlanta circuit in Georgia. This will be the final race of the season, contested as part of the prestigious “Petit Le Mans”, on October 6th. previous post: Another Top 5 for Jesse Lazare, Chris Green and the MIA Team in Virginia! next post: Victory for Jesse Lazare, Chris Green and Team MIA in Georgia!